A COUPLE OF WEEKS ago two of us went over to the Intertabak in Dortmund, Germany to spend a day at the show catching up with some of our suppliers, past , present and future. The Intertabak is the major European Tobacco trade fair. Some of our colleagues were staying in the same hotel as us so we managed to catch up on our arrival on Friday night, and sat around discussing some of the issues facing the pipe industry, including the smoking ban and the dwindling availability of good quality briar. However, there was a lot of positivity and the general feeling was that the show was busy and vibrant. There were a couple of specific things we wanted to look out for such as hand made cigars, new pipe makes and styles, designers we had not heard from for years, and to discuss new tobaccos with the manufacturers. The first thing we did after breakfast on Saturday was chat with our cigar and guest tobacco suppliers from the Isle of Man about the current ranges we offer, the bottom line being that we can and will expand these again next year, offering much more choice. 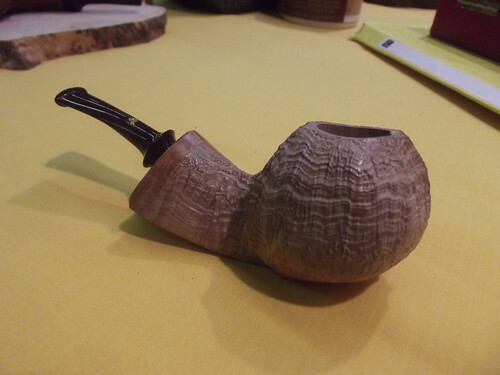 Then it was off to the show, where a quick scout around revealed one new manufacturer straight away, a wonderful Italian freehand pipe maker who is a hobbyist making very high quality and distinct pipes. Then it was on to meet our VAUEN pipes, whose stand is always immaculately laid out. They showed us some of their new pipes in production at the moment, more of which we will bring you very soon. We also spoke to the company’s owner and director who we have met in the past. Once again the stand seemed very busy with lots of new shapes and ideas, not surprising I guess for the oldest German pipe manufacturer. Once we had finished there it was time to meet our dear old friends from Gardesana, the famiglia Rovera who we have known for years. Indeed Garrick has been out there on many occasion and worked in the factory for a summer a long time ago. Some of our meetings were business related, others were a strengthening of relationships, as our suppliers seldom find the time to visit us in Guernsey. Chacom’s Antoine was next on the list, and although his stand was relatively small he was doing business on a grand scale, with so many pipes on view. Future pipe’s of the year were discussed and some new shapes available. The last couple of meetings of the afternoon were a bit rushed, it tends to get that way when you’ve only got one day at the show and in future we’ll try 2 or 3 I think. The Hauser stand was crazy as usual, with lots of characters, our contact especially, making sure all of their customers were happy and taken care of. There’s no doubt Hauser offer far more than we buy from them and their range is far reaching but more for novelty and gift shop tobacconists than for specialists like us. Finally, it was time to meet our Turkish meerschaum supplier who had been in Europe for a week seeing various clients. It was a good meeting with him explaining the intricacies of supply of this rare mineral, and their government’s involvement with exporting it. However, business is good and we have a great relationship here with a constant supply for small businesses like ours. So, all-in-all a good day’s work, followed by a trade dinner at a local pub/restaurant where the food and drink were plentiful and the company was great fun. The following morning we returned to the show for an hour to visit the Falcon stand, and had a wonderful chat with Roger and the rest of the team there. Their pipe of the year will be available through us very soon, in the next catalogue in fact, so keep an eye out for that. On the way we also bumped into Northern Briars who have been very supportive through Ian’s repairs over the years. The pipes there we fabulous but we’d obviously missed most of them, as there were half a dozen left out of the 60 they’d brought along. The thing that always amazes me at this event is the camaraderie between all in the trade, and we were made to feel very welcome amnong colleagues with whom we have been acquainted over the past 30-odd years, some of who have been in the trade for a lot longer than that! This entry was posted in General, Product, Salon and tagged blend, chacom, dortmund, dr plumb, intertabak, Magic Inch, peterson, pipe, pipe smoking, pipe tobacco, sampler, show, smoking, tobacconist, trade, vauen. Bookmark the permalink. Thanks for keeping us posted. Sound like the kind of event I’d love to visit. Yes, it is a fantastic event, full of colourful characters and a great atmosphere. Highly recommended for pipe lovers. Thanks for your feedback John.